Don't check out for the weekend just yet! 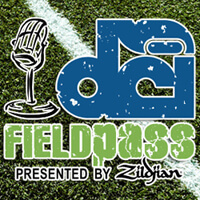 In today's Field Pass presented by Zildjian, Dan Potter tests your brain functions with the toughest Time Capsule contest to date. But if that's too much to handle for a Friday, drain that strain on your brain with a review of upcoming events, listener e-mails and your corps performance requests, as Drum Corps International steps off into the fourth weekend of the season which promises to be the most exciting yet.